Knowing that someone is watching and judging your every move can be pretty bizarre as well. It would be enough to make most people feel self-conscious if they were just carrying out an everyday task such as opening their post, let alone demonstrating a complex skill like driving. So if you’ve got your test coming up and you’re feeling anxious about it, then remember you’re not alone. Most people suffer from nerves to some extent and they can in fact be beneficial by raising your adrenaline levels and making you more alert. The challenge is keeping them under control. Remind yourself that your driving instructor wouldn’t be putting you in for your test if he or she didn’t think you were good enough. During your lessons you’re already driving at a standard where they consider you’re safe and responsible enough to be on your own. Now all you’ve got to do is to show the examiner what you’re capable of and that driving licence is all yours! Breathing exercises can be very useful – focusing on your in and out breaths will have a soothing effect – you might like to try counting the breaths, or focusing on a mantra such as ‘I feel calm’. Shortly before your test, eat a banana. It’s well-known among driving instructors as the driving test superfood, for the following reasons – bananas are full of B vitamins, which help calm the nerves. They contain tryptophan, a type of protein that the body converts into seratonin, the ‘happy hormone’ – which will keep your mood upbeat. And they’re also high in potassium. When we are stressed our metabolic rate rises and potassium levels decrease. Eating a high-potassium snack like a banana will help rebalance the levels of this important mineral, normalise your heartbeat and send extra oxygen to the brain. Caffeine can raise anxiety levels on certain people in unstressful situations never mind on the day of your test. So give it a miss for one day. 6: Drive exactly like you do on a lesson! 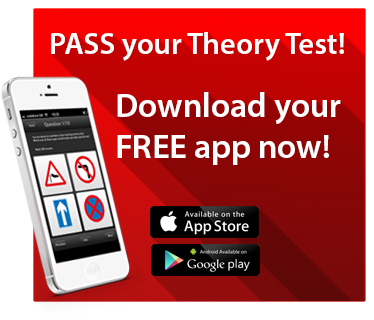 When you’re on your test don’t change your driving, drive the same as you do on a lesson. Try to treat your driving test as just another lesson. During the test your examiner may not chat at all, but some do. Your examiner won’t chat when you’re right in the middle of something. They’ll wait until you’re not doing much. If the examiner doesn’t chat at all, don’t worry just keep focused.